One of biggest blockbusters of the silent era, is a dazzling Arabian Nights adventure fantasy and one of the most imaginative of all movies. The elaborate and lush backgrounds and the massive sets by William Cameron Menzies (who would later design Gone With the Wind) all have an expressionistic quality unique for American films of the time. The amazingly acrobatic and energetic Fairbanks is at his impudent best as the dashing Ahmed, the thief who wins a princess. New York, NY (January 22, 2013) - Hollywood's first great action hero was Douglas Fairbanks, and one of his most iconic movies is returning in a pristine new restoration. 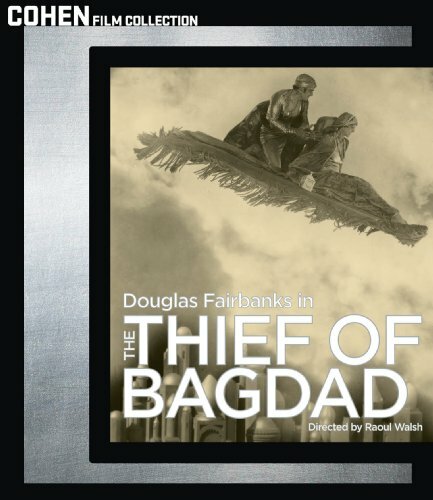 The Thief of Bagdad , Fairbanks' magnificent 1924 fantasy epic, arrives on high-definition Blu-ray and DVD on February 19, 2013. It is the inaugural release of Cohen Media Group's Cohen Film Collection. The Thief of Bagdad , one of biggest blockbusters of the silent era, is a dazzling Arabian Nights adventure fantasy and one of the most imaginative of all movies. The elaborate and lush backgrounds and the massive sets by William Cameron Menzies (who would later design Gone With the Wind) all have an expressionistic quality unique for American films of the time. The amazingly acrobatic and energetic Fairbanks is at his impudent best as the dashing Ahmed, the thief who wins a princess. The Thief of Bagdad D - directed by the master Raoul Walsh (The Roaring Twenties, High Sierra, White Heat) - marked a new pinnacle of heroic action cinema. Wrote film historian Jeanine Basinger, author of Silent Stars: "No film of Fairbanks' presented a greater spectacle." Silent-film expert Kevin Brownlow (The Parade's Gone By) called the film "a magic carpet ride of effects and stunts. ... So imaginative and extraordinary." Generations of film lovers have marveled at Fairbanks' feats of derring-do. Alistair Cooke, in a 1940 summation Fairbanks' career, said the star's genius derived from his seemingly effortless command of his body and his environment, "a virtuoso use of the landscape as a natural gymnasium whose equipment is invisible to the ordinary man." The Thief of Bagdad was selected for preservation in the National Film Registry by the Library of Congress. In the American Film Institute's 2008 poll of the creative community, the classic ranked in the Top Ten Fantasy Films of all time. The Thief of Bagdad features silent film score maestro Carl Davis (Napoleon) conducting the Philharmonia Orchestra, performing a magnificent score that intermingles Davis' own music with the famous Orientalia of Rimsky-Korsakov. The soundtrack is in 5.1 Dolby Digital for DVD and state-of-the-art DTS-HD Master Audio for Blu-ray. Blu-ray and DVD extras include running audio commentary by Douglas Fairbanks biographer Jeffrey Vance and a featurette about the making of the film and its impact, including rare behind-the-scenes photographs. Formed in 2008 by Charles S. Cohen, an executive producer of multiple Academy Award nomineeFrozen River, the COHEN MEDIA GROUP, LLC (CMG) is a theatrical film production company that has been steadily developing into a dynamic, positive force within the film industry. By 2010, with the addition of Steve Scheffer and Edmondo Schwartz to its team, CMG established a formidable distribution division. COHEN MEDIA GROUP's intent is to produce and distribute select films throughout North America annually, allowing the CMG team to devote their best efforts toward each, unique film's fullest potential. Current and upcoming CMG releases include Lorraine Levy's The Other Son (winner of the Grand Prize and Best Director prize at the 2012 Tokyo International Film Festival); French director Francois Ozon's thriller In The House (San Sebastian Film Festival's winner of the Golden Shell and Best Screenplay award; Spain's official entry to the Academy awards, Blancanieves; Fernando Trueba's The Artist and The Model starring Jean Rochefort and Claudia Cardinale; and Lebanese director Ziad Doueiri's The Attack.